These days, Christine spends a lot of her time visiting zoos, museums, and playgrounds with her toddler when she’s not at work. 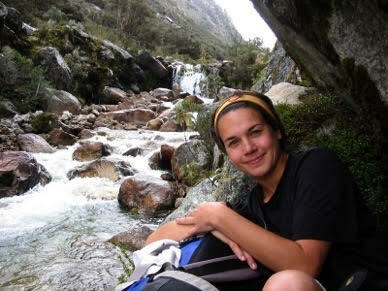 Some of her other favorite pastimes have been rock climbing, camping, and other outdoor activities. Christine studies the mechanical and geological features of ice and rocks. Even though on the surface rocks appear static, deep within the earth they undergo dynamic deformations, and she studies these processes, as well as how ice moves and flows. Science wasn’t Christine’s first career. She got her first undergraduate degree in communications, and she was passionate about dance. While working as a paralegal at a law firm in San Francisco, Christine was introduced to rock climbing, and it quickly became a new favorite hobby for her. As she spent time rock climbing, Christine began to appreciate and become fascinated by all the cool geological formations she saw. She decided to leave her job and go back to school to study geology. Christine faced a lot of hurdles going back to school to get her second bachelor’s degree. She decided to take some night classes first to see if she could actually do it before quitting her job. Taking the math placement exam was frustrating because she didn’t do as well as she had hoped. However, Christine was able to get a tutor to help her refresh her math skills, and she did much better the second time. Christine’s persistence paid off, and she successfully completed her undergraduate studies in geology and continued on in her new career in science. During her PhD in 2007 and 2008, Christine did some experimental work that she wrote up for her thesis, but there were still a lot of details that needed to be sorted out, and the story wasn’t clear so they didn’t publish the data immediately. Data from this research project were just recently published this year after a lot of corresponding back and forth with her advisor and teasing apart elements of this complex dataset. It was exciting to finally see this work disseminated in the field. Spending two years in Tokyo for her postdoctoral fellowship was an unforgettable experience. It was amazing to be able to stay there long enough to not only see the touristy places, but to also get off the beaten path. She fondly remembers taking a boat to explore some of the small islands of the coast of Japan, as well as a wonderful summer BBQ with colleagues where there were people hammering out mochi and everyone was dressed in traditional yukata. As a graduate student, Christine had the pleasure of working with a particularly complicated high pressure ice deformation rig that her advisor had built. She recalls him teaching her the impressively complex dance required to set up and operate the machine, pushing lots of different buttons and levers. It was humorous later when he was showing her how to work the high pressure coffee maker in his house that seemed to have a similarly ridiculous number of steps. Pursue what you are passionate about, and it is never too late to go back to school to change your career. Christine McCarthy is a research scientist at Columbia’s Lamont Doherty Earth Observatory. She received her Masters and Ph.D. from Brown University, after which she conducted a two-year postdoc fellowship in Tokyo. She specializes in running laboratory experiments that explore how ice and other geologic materials respond to external forcing. In particular she is interested in how features at the microscopic scale affect macroscopic-scale behavior, such as how glaciers flow or how seismic waves are damped as they travel through the earth. When she’s not squeezing or breaking rocks and ice, she likes to scale and slide on them: she’s an avid rock climber and snowboarder, though admits that she doesn’t get out in nature nearly enough these days. She and her husband live in New York City with an inquisitive toddler and another child on the way.